I know that February is over, but I wanted to present one more African American artist who has such a compelling body of work. Marion Perkins’ sculpture presents the rich tradition of African sculpture with a modern infusion of Cubism and simple abstraction. African sculpture—both masks and figurative works—were a major influence on abstraction in European sculpture and painting during the early 1900s. I’m loving the fact that in the mid 1900s, the tradition of simplification of form (a key element in abstraction) persisted in the works of African American artists such as Marion Perkins. Born in Arkansas, Perkins subsequently grew up with an aunt on the South Side of Chicago. During the 1920s and 1930s, the South Side was a lively artistic community for artists, musicians, and authors, much akin to the Harlem Renaissance in New York. 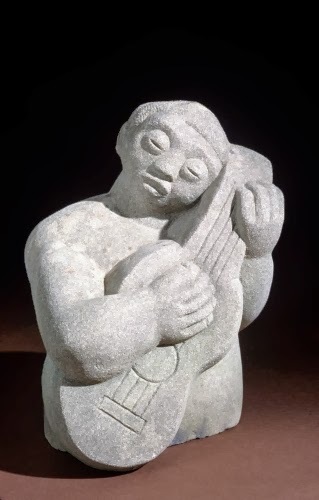 He was trained at the School of the Art Institute in Chicago in academic sculpture methods, but was drawn to modernist experiment in Europe at the time in the work of Constantin Brancusi (1876–1957), Amedeo Modigliani (1884–1920), and Jacques Lipchitz (1891–1973). While Perkins was drawn to their simplification of surfaces, based in the Cubism movement, Perkins’ sculptures never strayed from the object. These European modernists had been influenced by African sculpture, and that was the driving forced behind Perkins' work. Although his work is reminiscent of the Cubist sculpture of the late 1910s, it reflects identification with African sculpture where the interest in subject is emphasized over formal concerns. Perkins was actively involved in promoting the art of minorities in Chicago. In the 1950s, along with Margaret Burroughs (founder of the first museum dedicated to African American art, the DuSable Museum in Chicago) established yearly street fairs on the South Side of Chicago to highlight to art of young African Americans. They also founded the South Side Art Center, which encourage African American youth to get involved in the arts, including large-scale mural projects around the city of Chicago.